Well, we told you we'd be doing plenty of work once summer began and we've already got a new video for you. Yes, we shot it just yesterday, when we found our camera hidden behind some books in our library. It is so big, we frequently lose things in it. Anyway, the video consists of Kate doing some arts and crafts featuring scissors and a pair of yellow Crocs. We hope you like it and we also hope you will like the next few videos we have planned. Get the word out, Croc-Blockers. Our time is nigh! A plague of biblical proportions. 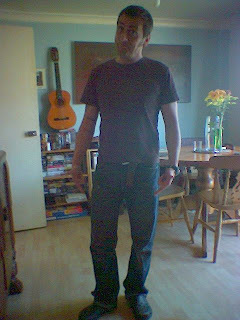 With the warmer weather becoming more and more apparent in our corner of the globe, Vincenzo has been urging me out of the dark, cavernous recesses of the manor. Summer is upon us at last, and he can no longer do it alone. The menace is back, with a vengeance. Just when we had begun to hope that the ravages of cold and time would put to rest this ungodly fad, they get corporate sponsorship. I was absolutely horrified today, upon visiting the local Shoppe-Mall to pick up some food for the horses, to find Crocs with Mickey-Mouse stamped holes in them. You, too, can have a conglomerate icon sunburnt onto your feet. The horror! Not only that, but I saw them in nearly every store. I saw imitations in stores catered to children too young to fight back. I saw knock-offs in shoe stores, racks upon racks towering over unsuspecting customers. Like cockroaches crawling out from beneath the ruin of the apocalypse, Crocs are back, and the slaughter of acceptable footwear must be stemmed. It's time to step up and fight. Summer is here. 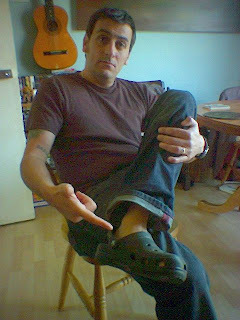 Peter Barlow from Coronation Street says no to Crocs - so can you! The weather is getting warmer and warmer. Yesterday, I didn't wear my jacket and instead of taking our heated, chauffeured car to town, Kate and I walked. It was very pleasant, though we both know that with the new warmth, Crocs have returned. A friend of mine recently visited my house.